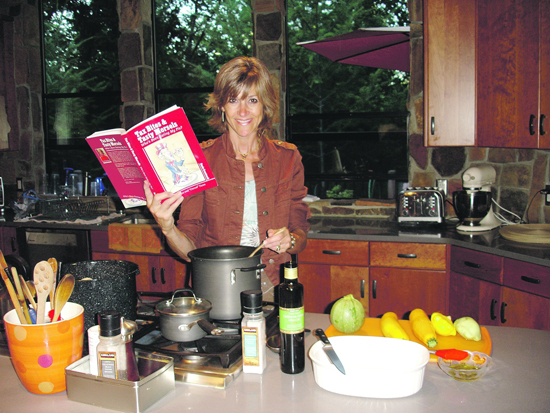 The new cookbook authored by Susie Iventosch, Lamorinda Weekly's beloved food columnist, is not only a valuable resource in the kitchen but an interesting read. While most cookbooks have limited usefulness outside of mealtimes, Iventosch's first published recipe collection, entitled Tax Bites & Tasty Morsels, Who's Been Eating My Pie?, serves up 151 innovative recipes along with as many intriguing facts-what she terms tax bites-about the U.S. tax system. Cooks and non-cooks alike will find the cookbook filled with an array of delicious, comprehensible recipes with accessible ingredients that Iventosch has culled from a variety of sources and tested and adapted over the years. And conservatives and liberals alike will find the tax bites thought provoking and understandable or incomprehensible depending upon their outlook. The concept for a cookbook filled with unique tax facts was hatched when Iventosch branched out on her own and started working as an independent contractor. "I was amazed, actually appalled, when I realized the amount of federal, state, and self-employment tax that got first dibs on my paychecks," says Iventosch. "Sometimes, I thought, why work?" Iventosch, a self-described fiscal conservative, amassed a wide-ranging knowledge of federal and state taxes through her extensive research for the book. The cookbook is organized into chapters by food course with pithy titles and brief essays on tax topics, such as the chapter called Un-Just Desserts, The Government's Final Helping, which includes her discourse on the death tax. Every recipe has an accompanying tax bite-fiscal nuggets that are informative, salient, crazy, egregious and everywhere in between. One of the tax bites that Iventosch finds most amusing is the Illegal Drug Stamp tax. "Twenty states impose this tax, which is so funny, because it is a stamp tax that must be purchased and affixed to illegal contraband. So, if the person is arrested for the contraband, they will not be charged with tax evasion as well," she explains. Iventosch finds some of the tax bites in the chapter of pork recipes, titled Politicians Love Their Pork, harder to swallow. "As part of the 2009 Stimulus bill, $20 million was allocated to design and furnish the Department of Homeland Security headquarters," states Iventosch. She calls that tax bite Swine Design. Tax Bites & Tasty Morsels, Who's Been Eating My Pie? is available locally at Orinda Books and Across the Way in Moraga, at amazon.com, and at Iventosch's website http://taxbitesandtastymorsels.com. Iventosch's favorites are available on her website, where visitors can comment on the recipes or the taxes or submit their own tax bite. As she continues to collect new recipes and tax bites, Iventosch may be ready to generate a cookbook sequel-the working title, Tax Bites Two and All the Trimmings!